The Ultrapak cord is made of 100% cotton, knitted into thousands of tiny loops that form long, interlocking chains. The unique knitted design exerts a gentle, continuous outward force following placement as the knitted loops seek to open. 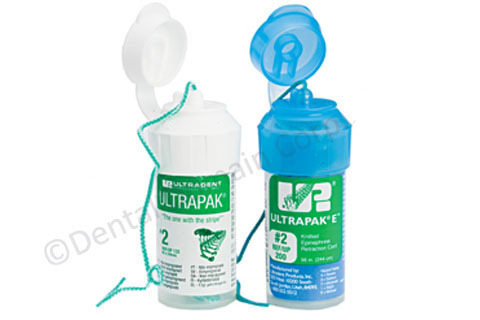 Ultrapak cord is designed to enhance the ViscoStat/Astringedent and Dento-Infusor Tissue Management Technique; however, conventional techniques using alum, aluminum chloride, etc., are also enhanced when using Ultrapak plain knitted cords, since they carry significantly greater quantities of hemostatic solution than conventional cords.